The Centormeter EASY is the perfect auditing tools for all your hand and powered torque tools: torque wrenches, screwdrivers, electric or pneumatic screwdrivers. It’s a simple and accurate unit which is ready to be installed in production environment or in labs, it has all the features required to audit and test your assembly torque equipments. Featuring an internal torque sensor, it’s dedicated to test all your low capacities torque tools, from 0.1 to 30Nm. All sensors are calibrated in clockwise and counter clockwise direction, as standard and come with linked COFRAC certificate of calibration. Andilog’s Centormeter Easy torque analyzer is dedicated to measure the applied torque by your torque tools. Simple to operate: The torque tool is inserted into the sensor’s square output. The measurement is displayed in real time. Typical applications: Calibration laboratories, Metrology department, Method Engineers, Manufacturing Engineers. 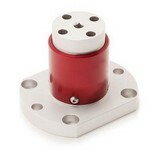 The SPIP CMV/TH series of remote torque sensors is available in range from 60Nm to 600Nm; and assembled on a grooved flange support plate for a perfect mounting on test bench and prevent from rotation during uses.